Rafi pleaded Mujhe mat roko mujhe gaane do in front of a 12,000-strong audience at the Netaji Indoor Stadium, Calcutta, on a February night in 1980, sending a strong signal to the producers and the powers-that-be in the Bombay film industry. Almost 40 years before that, Rafi had to persuade his father to let him go to Bombay so that he could sing in films. When Rafiâ€™s father came to see him off at the railway station, he told Rafi, â€œBe a good man.â€ Twenty seven years after Rafi left us, we still keep debating whether he was a greater singer or a greater human being. When Laxmikant and Pyarelal composed their first film song, Rafi handed over the fee that he received to them saying â€œwapas mein bnaat loâ€. When Rafi sensed that debutante Usha Khanna was hesitant about expressing her views on the way he had sung one part of a song, he told her, â€œUsha, tumne humse nahin seekhna, hamein tumse gaana seekhna hai.â€ Bengalâ€™s well-known composer and singer Satinath Mukhopadhyay was sent to Bombay to record a Puja album with Rafi in 1979 with only Rs. 1,000 in his pocket. When Rafi came to know that Satinath could not book any of the recording studios, he reacted angrily, â€œYeh kya budtameezi haiâ€, and asked his secretary to book the studio in Mohammed Rafiâ€™s name. Stories of his kind-heartedness and humility abound. Probably, it was his persona, along with his amazing talent as a singer, which used to bring tears to his fansâ€™ eyes. As he stepped onto the elevated podium in the middle of the oval stadium waving to his cheering fans, chants of â€œRofiâ€, â€œRofiâ€, â€œRofiâ€ rent the evening year. Their faces were happy with joy but their eyes were moist. Much before Independence, Rafi had to face a different audience in the city of Lahore. That was when the microphone had failed during a Saigal concert and Rafi was summoned to sing a few songs to entertain the people in the audience. Barely in his teens, the lad regaled the audience to such an extent that Saigal later remarked, â€œRafi, the keys to the kingdom are yoursâ€. Kundan Lal Saigal, who came from Punjab to Calcutta to work as a typewriter salesman and was discovered by Raichand Boral, one of the stalwarts of New Theatres. The day after Rafi passed away, Boral recollected an episode on AIR Calcutta. Boral was composing a song in the kirtan style (a Bengali devotional form of singing) and he was a little apprehensive about Rafi being able to do full justice. If Rafi was not up to the mark, he thought, he would get Bengalâ€™s own Dhananjoy Bhattacharyya to sing the kirtan. Anyway, Rafi was summoned and after a few rehearsals, he requested Boral to give him some time to himself. During that period, Boral recalled, Rafi went to one corner of the room, did his namaz, and then came back for the final take. Boral was simply floored when he heard the final version. K. C. Dey, the famous blind singer of Bengal and Manna Deyâ€™s uncle, used to love Rafi. In his autobiography, Manna Dey recounts how K.C. Dey had once asked him to rehearse a song and then help Rafi render it perfectly. Manna Dey writes that he was shattered, but realised years later that Rafi was really the right person for the song. S. D. Burman, a disciple of K. C. Deyâ€™s, would also sometimes indulge in this ploy with Manna-Rafi. Calcutta, the city of Guru Dutt, would form the backdrop for Pyaasa. This year marks the 50th anniversary of Pyaasa, for which Sahir Ludhianvi wrote some of the most creative poetry on celluloid. S. D. Burman would set this beautiful Urdu poetry to music. And Rafi would deliver two of the most memorable songs in Hindi film music: Yeh mahalon yeh takht-on yeh taaj-on ki duniyaâ€¦Yeh duniya agar mil bhi jaaye to kya hai and Jinhe naaz hai hind par woh kahan hai. The first expresses the protagonistâ€™s disillusionment with the material world and the second his rebellious, anti-establishment spirit. But, more than anything else, these two songs defined the standards for playback singing. When you watch Guru Dutt rendering those songs on screen, it is almost impossible to realise that the actual voice was someone elseâ€™s. With those two songs, Rafi set the bar for playback singing so high that no singer â€“ past or present, male or female, North or South, East or West â€“ would dare to reach that level. In Guru Duttâ€™s next film, Kaagaz ke Phool, S. D. Burman composed another classic for Rafi, Dekhi zamane ki yaari, written by Kaifi Azmi. And with that song, Rafi demonstrated that it was he and only he who was destined to scale such lofty heights in delivering poetry on celluloid. Amin Sayani, who was compering the Calcutta function, went forward and welcomed Rafi to the stage. The song that Rafi started with was Madhuban mein radhika nache re, written by Shakeel Badayuni and composed in Hamir by Naushad. That song, the kohinoor of film music, still dazzles music lovers all across the country. There were people in Calcutta who did not know much about Hindi film music, but when asked about Rafi, they would say, â€œUni Madhuban mein radhika geyechhen na?â€ (Didnâ€™t he sing Madhuban mein radhika?) as if that one song was enough to prove Rafiâ€™s greatness. Shankar-Jaikishan composed the beautiful Radhike tu ne bansuri churayi, sung so well by Rafi, but could not diminish the lustre of the original kohinoor. S. D. Burman utilised Rafi for Nache man mora magan dhik dha dhigi dhigi in Meri Surat Teri Aankhen. Rafi once again demonstrated his ustadi with this Bhairavi composition set in kaharwa taal. His singing was complemented beautifully on the tabla by Pandit Samta Prasad. In the same film, Rafi poured his heart into Tere bin sooni nayan hamare, one of the best Rafi-Lata duets of all time. The tune was based on Dadaâ€™s famous Bengali song, Ami chhinu eka baashara jaagaaye, set in Piloo. But Madhuban mein radhika remains the epitome of the classical song, without which a compilation of classical film songs is unthinkable. Gyan Prakash Ghosh, one of the pundits of Hindustani classical music and the guru of some of the most well-known classical vocalists and percussionists, considered Rafi to be the best exponent of semi-classical songs. Before taking a break in the middle, Rafi sang another Naushad composition, O duniya ke rakwhale, from Baiju Bawra, the film that demonstrated beyond doubt his peerless quality as a singer. A voice that was the perfect harmony of bhakti and shakti. For those of us who have been fortunate to hear Rafi sing this live, it is an unforgettable experience. While singing this Darbari Kanada composition, Rafi would repeat the Mahal udaas aur galiyan sooni alaap several times, elevating his voice to touch the higher notes with the slightest of efforts, and then pack so much emotion into the word â€œsooniâ€ that the crowd would erupt with tears. The voice that appealed to your head as well as your heart! And then the voice would fall from high to low in a few seconds. The voice that ruled the octaves! In the same film, Rafi also sang Man tadpat hari darshan ko in Malkauns, which remains the best exposition of that raga in film music to this day. The bhajan that became a symbol of a pluralistic, tolerant and newly-independent India. 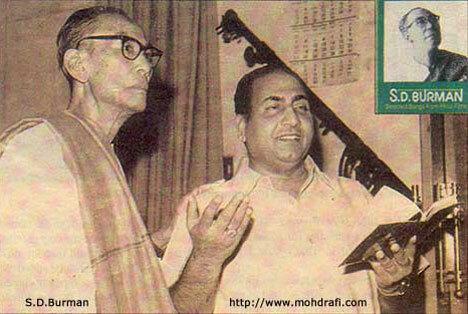 Shakeel, Naushad and Rafi â€“ three devout Muslims â€“ would produce the greatest bhajan ever in film music. And when you hear Rafi enunciating â€œHari Omâ€, two of the most sacred words in the Hindu lexicon, you will have to acknowledge that his was the most divine voice in film music! Rafi took a break for around 15 minutes after singing Duniya ke rakhwale. Just before that song, he had screamed Yahoo! Chahe koi mujhe junglee kahe, the song that started a cult following for the Rafi-Shammi combo. The junglees in the audience took off their shirts and danced to Rafiâ€™s vocal pyrotechnics. Rafi was playing to the gallery and enjoying it immensely. The voice that catered to the layman and the connoisseur alike! During the break, even from a distance, we could see Rafi mopping his forehead with his handkerchief. Amin Sayani later recalled that Rafi was not feeling well and asked him if he would like to end the concert. Rafiâ€™s answer was that people had paid to watch and hear him sing, so there was no question of doing that. Little did we realise that Rafi might have begun to feel the pangs within. During the break, the fans were sharing notes with one another. Some of them wanted to hear songs from Guide, others wanted to hear songs from Dosti; the list was endless. And I was thinking to myself, Which song from Guide and which song from Dosti are they talking about? In the three Guide solos, Rafi demonstrated â€“ perhaps for the umpteenth time â€“ that when it comes to playback singing, there was no one even close. The voice that could work wonders for Dev Anand, Dilip Kumar, Guru Dutt, Bharat Bhushan, Pradeep Kumar, Shammi Kapoor, Raj Kumar, Rajendra Kumar, Dharmendra, Shashi Kapoor, Joy Mukherjee, Biswajit, Johnny Walker and Mehmood. The common thread that weaved its magic across all types of actors. The voice of stars! 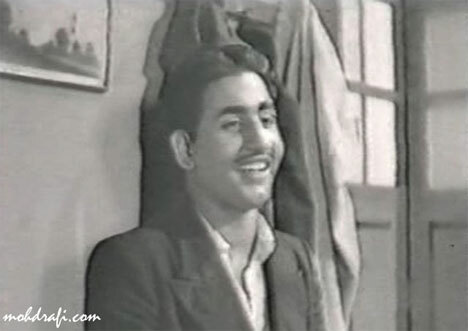 There were five solos that Rafi sang in Dosti, each in a league of its own, for a pair of unknown actors. Laxmi-Pyare had made their first major breakthrough and they would remain fiercely loyal to Rafi till his last day. It was time for Rafi to croon the perennial favourite, Baharon phool barsao, the suraj that rose in 1966 and still keeps shining. No Rafi concert would be complete without this song. Composed by Shankar-Jaikishan and based on Hasrat Jaipuriâ€™s lyrics, this has been one of the greatest romantic songs of all time. Shankar-Jaikishan, the duo that composed the maximum number of hits for Rafi. How much Rafi must have missed Jai since he passed away in 1971! It was Jai who composed Yeh mera prem patra padh kar which, in these days of email and instant messaging, still inspires lovers to write love letters the old-fashioned way. Hasrat may have written the prem patra in memory of his unrequited love, Jai may have composed the tune with his beloved in mind, but it is Rafi who takes this song to a level that would make any woman swoon when she hears the opening lines: Meherbaan likhoon, haseena likhoon, ya dilruba likhoon, hairaan hoon ki aap ko is khat mein kya likhoon. And the Hasrat-Jai-Rafi combo has produced so many other romantic songs â€“ Teri pyari pyari soorat ko, Dil ke jharokhe mein tujhko bithakar, Aye phoolon ki raani baharon ki malika â€“ that it is simply mind-boggling. Rafi, yours is the most romantic voice! And we have talked about only S-J for Rafiâ€™s romantic songs so far. How about S. D. Burman? Dil ka bhanwar kare pukar, Tere mere sapne ab ek rang hai, Mera man tera pyaasa. And Khoya khoya chand khula aasman, which Shailendra wrote sitting on the terrace of Dadaâ€™s Jet Bungalow with the moon playing hide and seek. And how about Dadaâ€™s son? Tum ne mujhe dekha, Deewana mujh sa nahin, Maine poochha chand se. How about Hemant Kumar, another Calcuttan? 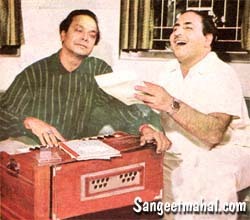 What an experience it would have been to hear the sonorous Hemant rehearsing Rafi for Tera husn rahe mera ishq rahe to yeh subah yeh shaam rahe na rahe in Do Dil! The year 1976 heralded the beginning of a new innings for Rafi with Laila Majnu. For that film, he lent his voice for the third generation of Kapoors. The music was composed by Madan Mohan and, after his death, completed by Jaidev. 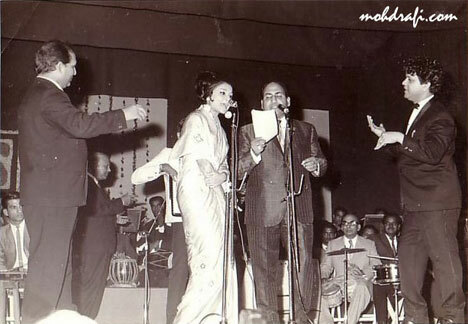 Most of the songs were major hits; Rafi chose to sing Tere dar pe aaya hoon at the concert. Madan Mohan, the King of Ghazals, gave Rafi some of the best ghazals in film history. He based Tujhe kya sunaoo main dilruba tere samne mera haal hai on Sajjadâ€™s famous composition for Talat, Yeh hawa yeh raat yeh chandni. Talat Mahmood, who stopped in Calcutta en route to Bombay in the guise of Tapan Kumar and delivered major Bengali hits like Duti paakhi duti teere. In Jahanara, Madan Mohan composed one of his finest ghazals for Talat, Phir wohi shaam wohi gam wohi tanhai hai, but for Kisi ki yaad mein duniya ko hai bhulaye huye he turned to Rafi. What he has composed for Rafi is a collectorâ€™s delight: Tumhari zulf ke saaye mein shaam kar loonga, Meri awaaz suno pyar ka raaz suno, Teri aankhon ke siva duniya mein, Mere pyar mein tujhe kya mila, Rang aur noor ki baraat kise pesh karoon, Main nigahen tere chehere se hataun kaise, Main yeh soch kar, Tu mere samne hai teri zulfe hai khuli, Tumse kahoon ek baat paronse halki halki, Tum jo mil gaye ho. Rafi, one of the best ghazal singers! That evening, after watching Rafi perform live, I was singing to myself, Ek haseen sham ko dil mera kho gaya. And who can forget how he rendered Kaifiâ€™s famous lines, Kar chale hum fida jaan-o-tan saathiyonâ€¦Zinda rehne ke mausam bahut hai magar, jaan dene ki rut roz aati nahin… baandh lo apne sar pe kafan saathiyon. The most patriotic voice! In his dying days, Madan Mohan would keep listening to two of his compositions, Yeh duniya yeh mefil and, sadly enough, Sochta hoon piyun, piyun na piyunâ€¦ sawan ke mahine mein! Rafi, yours is the best sharabi voice! Rafi then decided to sing a hit shaadi number composed by Ravi, Aaj mere yaar ki shaadi hai, and the crowd loved it. Ravi, who scored a double century with Rafi, has played some of the most beautiful strokes with his favourite bat: Chaudhvin ka chand ho, Chhoo lene do nazuk hnoto ko, Sau baar janam lenge, Door rahe kar na karo baat, Itni haseen itni jawan raat kya karen. And the other double centurion, Chitragupta, has always been the dark horse. Who can forget Mujhe dard-e-dil ka pata na tha and Jaag dil-e-deewana? And this year marks the 50th anniversary of Chal ud ja re panchhi; after listening to the tune, Rafi had told Chitragupta that he also felt like flying away. And, while on the subject of ghazals, let us not forget Khayyamâ€™s Jaane kya dhoondti and Kahin ek masoom nazuk si ladki, and S. N. Tripathiâ€™s Lagta nahin hai dil mera and Na kisi ki aankh ka noor hoon. Jaidev relayed a tune that he had heard somewhere to S. D. Burman, for whom he was working as an assistant. Sachin korta, one of the most intelligent composers, first adapted this tune for his Bengali song, Ghum bhulechhi nijhum e nishithe jege thaki. Then Majrooh wrote Hum bekhudi mein tum ko pukare chale gaye and Rafi rendered it to go on Dev in Kala Pani. 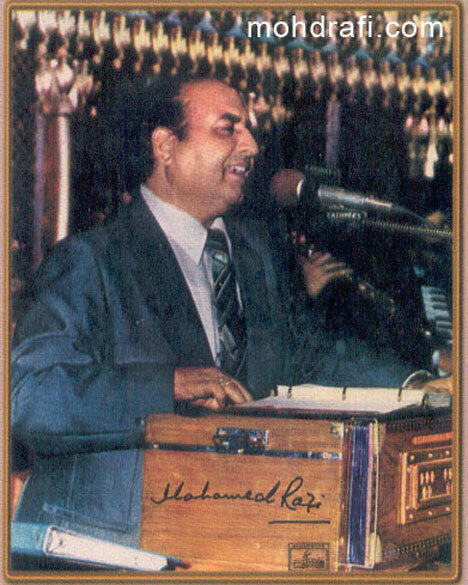 At an earlier concert, Amin Sayani had requested Rafi to sing this timeless classic in Chhayanat, to which Rafi responded, â€œMain koshish karoongaâ€ and followed up with a brilliant rendition. Jaidev waited for three more years to make his first major breakthrough with Hum Dono. Rafiâ€™s Main zindagi ka saath nibhata chala gaya, a gem written by Sahir, provided the leitmotif for Dev and, for the rest of us, the inspiration we need from time to time. Then there is the unforgettable Kabhi khud pe kabhi halat pe rona aaya. And, if you think that is more than enough for one film, thereâ€™s the Rafi-Asha duet, Abhi na jao chhod kar, which many consider to be the best duet ever in film music. The way Rafi alternates between throwing and retracting his voice still makes us feel dil abhi bhara nahin. Rafi, you have sung the best duets with Asha, Lata, Geeta and Suman! The crowd was getting a little restless; his fans wanted him to sing the hit qawaali from Amar Akbar Anthony. And thus started Pardah hai pardah hai but with a slight twist. Instead of Akbar mera naam nahin it became Rafi mera naam nahin. All the qawaalis in the film had become major hits. In another film, released around the same time, Rafi announced Hum kisise kum nahin. And as far as qawaalis are concerned, let us not forget Roshan, who composed one of the greatest qawaalis of all time, which starts with Na to karvan ki talash hai and then shifts to Yeh ishq ishq hai ishq ishq. Manna, Batish, Asha, Sudha, Rafi â€“ what a team! One can hear Rafiâ€™s sufi strains when he hits the high notes. The best qawaal in film music! And we also remember the other Roshan who illuminated our souls with Man re tu kahe na dheer dhare, Caravaan guzar gaya gubaar dekhte rahe,Zindagi bhar nahin bhoolegi woh barsaat ki raat, Jo baat tujhme hai teri tasveer mein nahin, Ab kya misal doon main tumhare shabab ki. In an earlier concert, I had heard Rafi sing Yun to hum ne laakh haseen dekhe hai composed by O. P. Nayyar, the King of Rhythm. The OP-Rafi combo symbolised lively and vibrant music. Pukarta chala hoon main epitomised their combination. Then you have Jawaniyan yeh mast mast, Laakhon hain nigahon mein, Phir wohi dil laya hoon, Aap ke haseen rukh pe. And the Rafi-Asha duet that made every music lover deewana: Deewana hua badal. What superb orchestration with sitar, sarangi, flute and drums! And Rafiâ€™s special emphasis on â€œdil jhoomaâ€. No one could play with words like he did! In Hai duniya usi ki zamana usi ka, Rafi performed a duet of a different kind, a duet with Manohari Singhâ€™s saxophone. 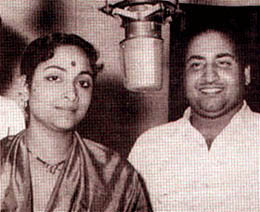 And who can forget some of the most popular duets OP composed for Rafi and Geeta in the fifties? Tum jo huye mere humsafar, Sun sun sun zalima, Aankhon hi aanhkhon mein, Udhar tum haseen ho, Jaane kahan mera jigar gaya ji. Geeta, who had migrated from the other side of Bengal to Bombay at a young age, used to accompany Rafi for his early concerts abroad. But in the wake of personal problems in her life in the sixties, Geetaâ€™s Chupke se mile pyase pyase moments with Rafi were slowly came to an end. And, of course, when we talk about OP, we must mention the wonderful Rafi-Asha team. Maang ke saath tumhara, Main pyar ka rahi hoon, Aap yunhi agar humse milte rahe, Isharon isharon mein, Phir miloge kabhi, Mujhe mera pyar de de, Humdum mere khel na jaano; the list is practically endless. But before leaving the OP-Rafi topic, let us also remember Aanchal mein saja lena kaliyaan zulfon mein sitaare bhar lena, that priceless composition by a man who did not have any formal training in classical music. This year marks the 60th anniversary of Yahan badla wafa ka, the popular duet that Rafi shared with Noorjehan in Jugnu. The partition of the country that followed saw Noorjehan and Firoze Nizami, the composer of the song and one of Rafiâ€™s earliest mentors, leave for Pakistan. But Rafi, who himself told everyone Aye dil hai mushkil jeena yahan, finally relented, exclaiming Yeh hai Bombay meri jaan! Bombay, Calcutta, Lahore â€“ three cities separated by over a thousand miles, yet contributing significantly to the shared musical legacy of the subcontinent. And this man has been such an integral part of this glorious period in our history. But this is not the time to look back, Rafi thought. All the big producers, music directors and stars were flocking back to him in such a manner that it was clear that the eighties, just like the fifties and sixties, would also belong to him. He thanked his diehard fans with Ehsaan mere dil pe tumhara hai dosto. The king was back and was asking his chhota bhai and devoted fan to vacate the throne by invoking Lord Ramaâ€™s name: Ramji ki nikli sawari. Usha Timothy came on stage to accompany Rafi for another hit song from the same film, Dafli-wale dafli baja, in which he had a very small part. Sensing that the crowd wanted to hear more of him, Rafi took a ghungroo out of his coat pocket and began singing Ghungroo-wali ghungroo baja. It was almost midnight and the crowd wanted more. Rafi bawled Aaja aaja main hoon pyar tera and the crowd went wild. Marigolds were being thrown toward the stage. There was so much masti in his voice! Rafi motioned to his orchestra to stop playing and exclaimed, â€œAare wah, Kalkatta-walo ko kya ho gaya!â€ and then resumed his aajaâ€™s and jaajaâ€™s. R. D. Burman had created a sensation with Teesri Manzil and all its songs had Rafiâ€™s signature. The film ushered in a very different kind of sound to the music of the sixties. This year marks the 50th anniversary of another rock â€™n roll number, Laal laal gaal jaan ke hai laagu, composed by N. Datta for Mr. X. As the current generation says, Rafi rocks! Like LP and RD, Kalyanji Anandji had also made their big splash with Rafi in the sixties, in Jab Jab Phool Khile, where Rafi cautioned us, Pardesiyon se na ankhiyan milana. Those three were still around and Rafi was yearning to create new waves with them in the eighties. Ravi, Chitragupta and Usha Khanna were also around, Junior Roshan and junior Malik had already entered the scene, and the two junior Chitraguptas were waiting in the wings. All part of the same clan, the Rafi clan. But a few months later, after rehearsing for a Bengali Puja album with Basu-Manohari, the farishta left us. Uttam Kumar, Bengalâ€™s matinee idol, had passed away exactly a week ago. Rafi, with whom Uttam had a chhoti si mulaqat, was apparently not happy with the way the Bombay film industry had paid its tribute to the star. Whether or not he instructed the lyricist or Basu-Manohari to do something about it, we donâ€™t know. The album was never completed, but at the Calcutta concert, Rafi did sing Gul mohorer phool jhore jai, so beautifully composed by Basu-Manohari about a year and a half earlier. Basudev Chakraborty and Manohari Singh, who like so many musicians before and after them, had left Calcutta for Bombay in the fifties to pursue their musical dreams. This entry was posted on Thursday, August 30th, 2007 at 8:21 pm	and is filed under Meri Awaaz Suno. You can follow any responses to this entry through the RSS 2.0 feed. You can leave a response, or trackback from your own site. A very well written article!! Great Rafi sahab!! I am a class Xth student, yet, I sing his songs, and an admirer of him as a singer, as well as a human being, from whatever I have heard of him. Salute!! 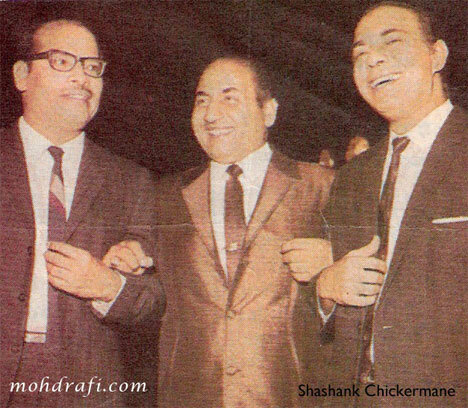 I especially love Shammi-Rafi-SJ combo!! I loved this article. I relived the magic of Rafi’s voice through all the songs listed in it. I was one of those people who had unashamedly wept the day he passed away. How could God be so cruel as to take away that voice from us?